Are you looking for an SEO tool whcih lets you keyword research,backlinks checking,competitors ranks&most importantly you want to do complete SEO audit of your blog? If yes,Then let me introduce one awesome tool which allows you to do complete SEO audit of your blog and it is most trusted tool by many professional bloggers and SEO companies.So far iam talking about SEMRUSH tool. SEMRUSH makes it really easy to find keywords for your site & also what keywords for your and other sites ranking for.Its a easy and simple process. Once you done keyword research,you can add keywords&track keywords position in major search engines.Here we can target Geographical locations like U.K,Australia,U.S etc.Especially who bloggers are targeting globally,They must use this tool for improve their site ranking in globally&specific country. It is a essential tool for every blogger and professional SEO companies.SEMRUSH is a product from the maker of SEO QUAKE,which is popular seo addon for firefox browser. 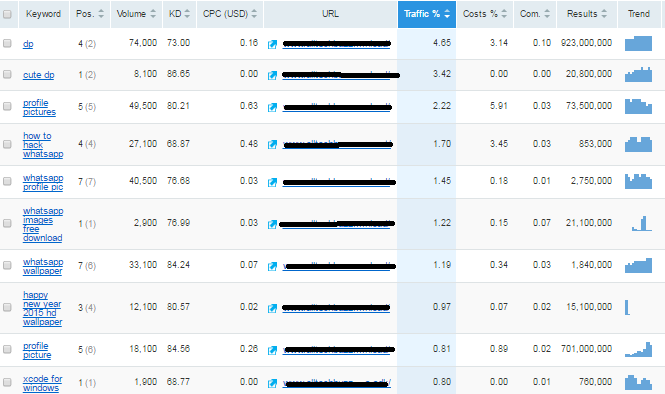 Add one of your competitors domain and you will get results like below figure. Keyword:-Keyword per specific ranked pages. Positions:-Keyword positions in the search engine. Volume:-Number of exact matche quries for the keyword in the search results . CPC:-Cost per click for a keyword. URL:-Corresponding URL to which that keyword is driving traffic. Com:-This shows competition between advertisers for a specific keyword. Trend:-Trend column gives you traffic trend for the keyword. 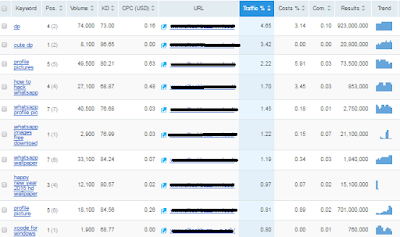 SEMRUSH gives you detailed report of organic keyword for domain &Backlinks report along with the links ,anchor text. Sign up here for SEMRUSH and use semrush features.